Using the best core exercises will make a major contribution to improving your abs. Whether your goal is to get a Six Pack, or just flatten and tone your stomach, using the best core exercises should be a priority. The core refers to the center of your body, consisting primarily of the muscles of your abs and back. These muscles support your spine while keeping your body balanced and stable. A strong core will not only look good, it will help keep your back healthy, and improve your ability to play sports. The range of reps listed below are just suggestions. Go at your own pace. Modify them to fit your fitness level. Gradually increase the reps each week. The best core exercises below involve the torso working as a solid unit, with front and back muscles contracting at the same time, or being used equally. Preparation: Hang from a bar (using either your hands or some ab straps). Your hips should be bent at about 90 degrees. 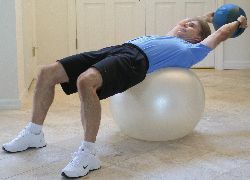 Movement: Using your lower abs, slowly roll your knees up toward your chest, curling your pelvis toward your rib cage. Exhale at the top of the lift, pause at the top, then inhale while slowly lowering back to the starting position. Don't let your legs hang straight down. Don't let them go past 90 degrees. - Most of the movement should occur in your abs, with your pelvis rotating upward. Just lifting your knees up and down changes the emphasis from your abs to your legs. - Go SLOW. Don't use leg swinging. Control the movement on the way down. - If you are doing it correctly, your torso will be completely stationary except for the pelvis rotation. No swinging. - This is one of the best core exercises and it's an advanced movement. 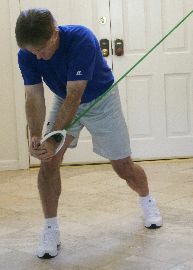 Preparation: Stand facing a cable weight machine or a doorway attached resistance tube (see pic). Feet should be staggered, with knees and hips bent slightly. The cable anchor should be at the top of the machine/doorway. Reach up and grab the handle with your left hand, with your right hand wrapped over the top of your left hand. 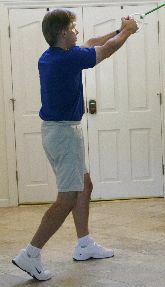 Movement: As you pivot on the balls of your feet, pull the handle downward to the right, across your body at a 45 degree angle down to just above your knee. Slowly return to the starting position, pivoting back on the balls of your feet. Perform the desired number of reps, then switch to the left side. - This is a great functional exercise, one of the best core exercises. The motion is similar to chopping wood with an ax. - To protect your back, keep your abs braced, with your torso fixed to your hips. The motion should be in your hips, not your spine. Your torso and hips should rotate as one unit. - Keep your arms in a firm, fixed position throughout the movement. - Exhale at the bottom, inhale on the return. Use a smooth, controlled movement. - Only use moderate resistance. Too heavy of resistance can cause you to "muscle it" and shift the focus to your arms, rather than your core. Preparation: Lie on your left side, body in a straight line, resting on your left forearm, with your right hand on your hip, feet stacked on top of each other. Movement: Lift your hips up into the air until your body is in a straight line from your shoulders to your feet. The only things contacting the mat are your forearm and the outside of your foot. Hold at the top for the desired time, then switch to the other side. - Keep breathing throughout the exercise. Don't hold your breath. - Keep your body in a sideways position, with eyes looking straight ahead. Imagine if your back was up against a wall. - There are multiple positional variations for this exercise. Beginners can go from their knees instead of their feet. Advanced can support on the hand instead of forearm. Your free hand can also reach straight up in the air, or you can reach through and underneath your body and then back up into the air. - An alternate foot position that some find more comfortable is with feet lined up heel to toe, with the top leg forward. 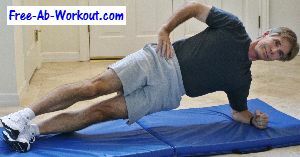 - As with the Plank, the Side Plank can be made even more difficult by placing your feet and/or arms on unstable objects such as an exercise ball and balance discs. The variety of possibilities with this exercise makes it one of the best core exercises. Preparation: Lie face down with your weight on your forearms and toes. Elbows should be bent at 90 degrees and directly under your shoulders. Rest on your forearms, knees, and toes before starting. Movement: Lift up off your knees so that you are supported on your forearms and toes. Your back should be level. Keep your head in line with your body and spine in a neutral alignment, brace your abs throughout the hold. Hold the planked position for 20 to 30 seconds to start. - The Plank can be made more difficult by placing your feet and/or arms on unstable objects such as an exercise ball and balance discs. You can also lift one foot or arm up, making it a 3 point plank. For a real challenge, lift an arm and foot! This is truly one of the best core exercises. Preparation: Kneel on the floor facing the Ab Wheel, thighs perpendicular to the floor. Grip the handles in each hand. Movement: Slowly glide forward to a stretched out position. Inhale as you're moving forward. Keep your abs braced (as though someone was going to punch you in the stomach) throughout the movement. Using your arms and upper body, roll yourself back, exhaling as you return to the starting position. - Only go out as far as you can comfortably, without straining. As you get stronger you'll be able to roll out fully. 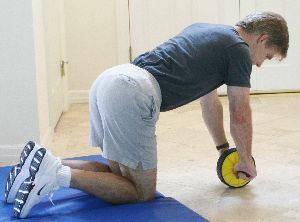 - The Ab Wheel exercise is not for beginners. It's one of the best core exercises, but you need a fair degree of core strength to do it safely. - Protect your back. Maintain the natural curvature of your lower back throughout the entire movement. Avoid rounding your back at any point. Remember: Always keep your abs braced strongly throughout the movement to avoid potential injury. Movement: Lift your upper body forward with your ab muscles, with your arms swinging the ball forward at the same time, as if your were going to throw the ball forward. Your upper body should raise to approximately a 45 degree angle. The ball should end up at a point that's over you belt line. Arms remain straight throughout the movement. Use a moderate speed on the way up, slow on the way down back to the starting position. - Beginners should use a 4-6 pound ball, Advanced: 8-12 pounds. - This movement can also be done explosively in a plyometric manner. - For full explosive power actually throw the ball, either to a partner or against a wall. 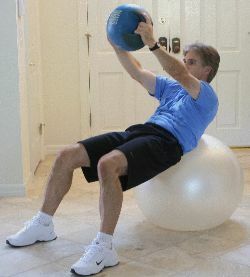 Many of the best core exercises utilize medicine balls or other form of outside resistance. Movement: Extend your right leg out at an approximately 40 degree angle from the floor, while simultaneously bringing your left knee in. Use your abs to twist your right shoulder and elbow up and across your body toward your left knee. Touch your knee with your elbow if you can. Reach only as far as you can without straining. Lower yourself back to the floor, then reverse the movement for the other side. Use a continuous fluid motion. Use some or all of the best core exercises in your workouts 2-3 times per week. Focusing on a variety of the best core exercises is the key to getting the best results. You should be changing up your workouts every 4-6 weeks for best results. Do 1-2 sets of each exercise. Sports Fitness Advisor delivers FREE, usable sports training tips, programs and workouts for enthusiastic athletes.